Love the flavors of Dark Chocolate and Orange? 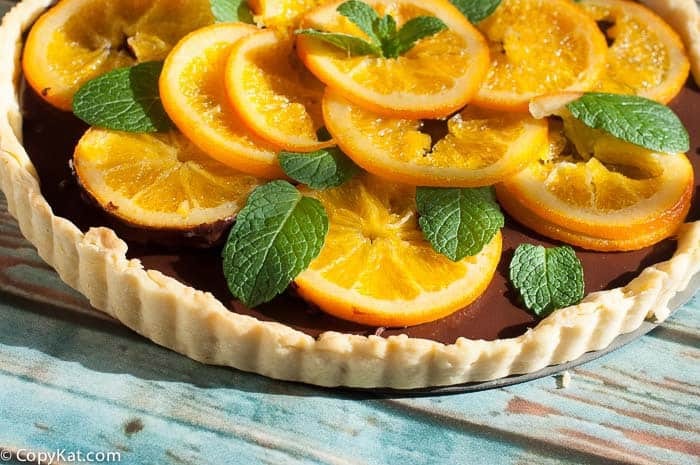 Try this amazing dark chocolate tart with candied orange slices. 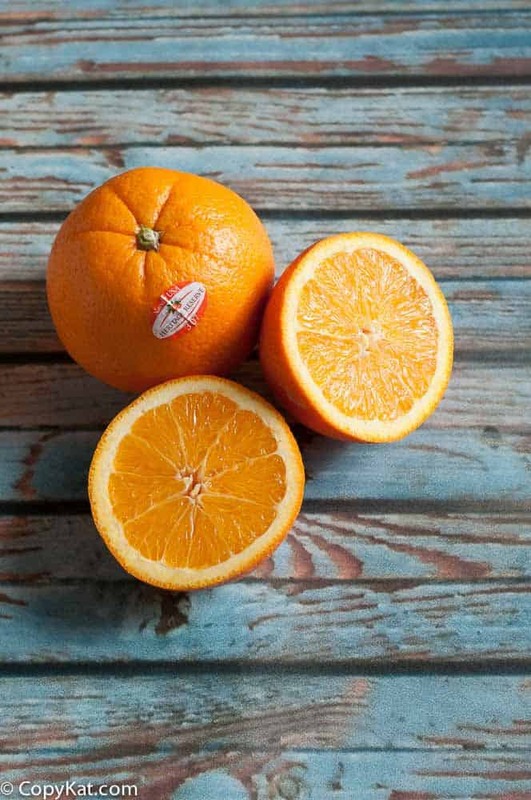 If you have never heard about the Heritage Reserve orange before you should try these, these oranges are from some of the oldest groves in California. These groves have been carefully nurtured, pruned and pampered into producing the extraordinary fruit. I thought these oranges were some of the best I had tried in my life. I normally enjoy oranges simply chilled and cut in half. These were so incredibly juicy that it was hard to resist these oranges. Since these trees are much older than other ones, the fruit tastes better because the trees don’t spend their energy on growing, but they spend their energy on producing rich, luscious fruit. I immediately began to think of how I could enjoy these oranges in a unique way. Dark chocolate and orange have always been two flavors I have enjoyed as long as I can remember. I went to work on this dark chocolate tart with candied orange slices on top. This flavor combination really brought out the sweet flavor of these oranges. I would encourage you to seek out the Heritage Reserve Oranges. You can read more about them on their Facebook Page. Dark chocolate is combined with candied orange slices, oh this is good. Candied orange directions: Wash oranges well and slice thin. Place orange slices into a pot of boiling water, allow oranges to remain in water for about 1 minute before removing. Repeat process a second time with fresh boiling water. When blanching the oranges for the second time place the slices into an ice water ball. Add 4 cups of water, and 2 cups of sugar to a pot over medium-high heat. Stir sugar into water until dissolved. Allow water to come to a boil, add orange slices, and then turn down the heat so the oranges simmer in the sugar water for about an hour. Remove oranges from the pot, and allow to dry on a rack. Tart shell directions Combine 1 1/2 cups flour, salt, and powdered sugar in a large bowl. Blend in 10 tablespoons of butter into the flour mixture until the crust has a crumbly texture. Add two egg yolks and water, and blend until smooth. Place dough into plastic wrap and refrigerate until well chilled. When the dough is well-chilled roll out and place into a 10-inch tart pan. Bake at 375 degrees for about 25 minutes. Allow the crust to cool completely. Place heavy cream and whole milk into a small pot. Heat milk until it simmers. Turn off heat. Add Triple Sec and chocolate. Stir chocolate in until it melts completely. Add in two large egg yolks and 4 tablespoons of butter, and blend until smooth. The heat of the milk is enough to cook the egg. Pour chocolate filling into the tart shell. When the chocolate has set, add slices of the candied orange to the tart. Chill tart until ready to serve. 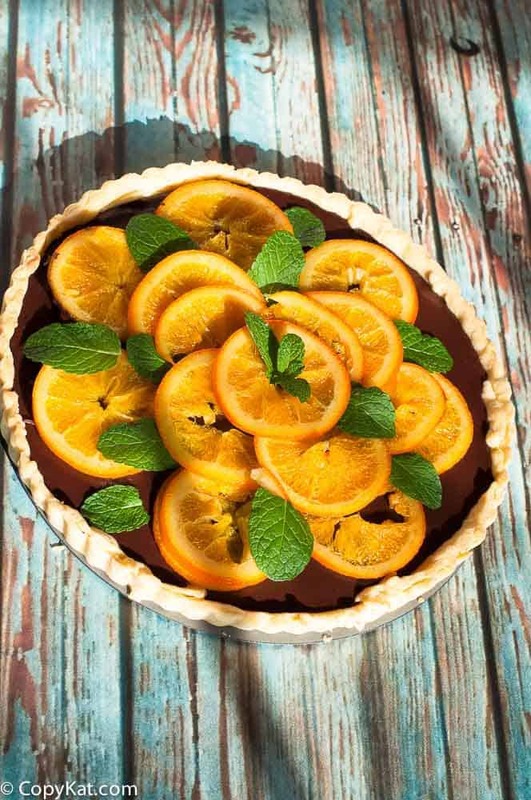 Dark Chocolate Tart with Candied Orange Slices, I am feeling only thinking of it. i love it. Indeed a great recipe. Loved it and would certainly try this weekend. 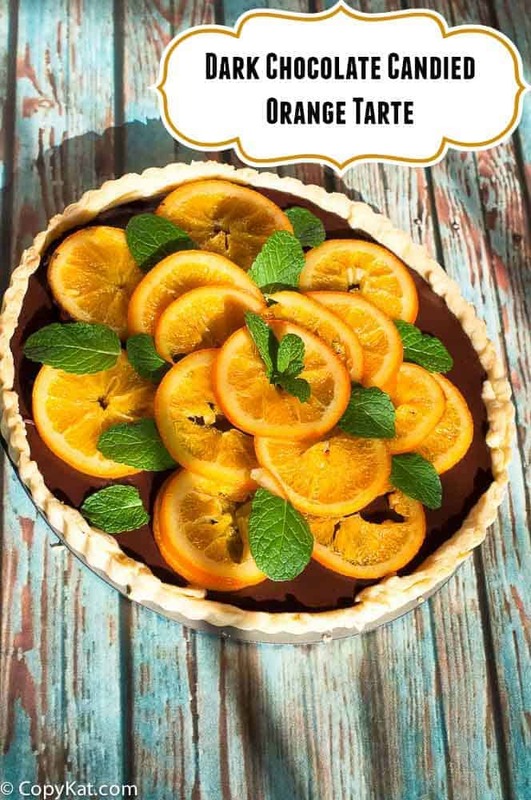 i would love to eat Dark Chocolate Tart, thanks for sharing recipe…. A great recipe indeed. Loved it.